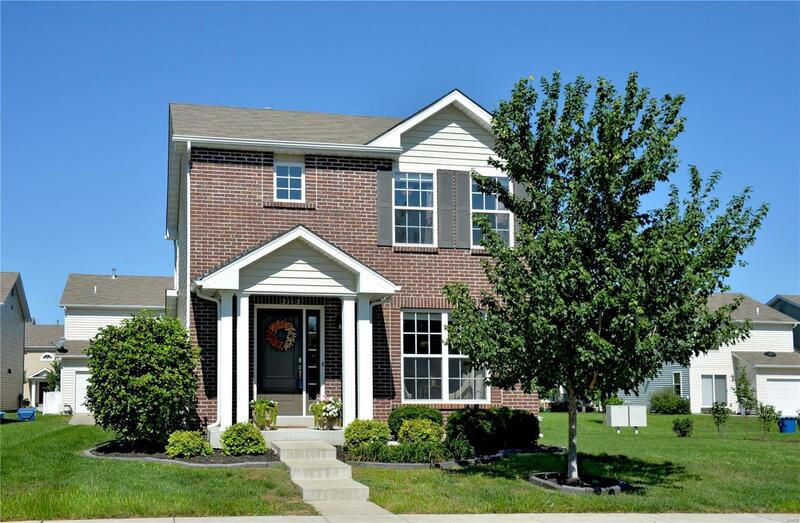 Move right into this beautifully landscaped 2 story in lovely Charlestowne! This community offers a lake, playgrounds, pocket parks & peaceful waterside pavilion to relax in! Within walking distance to New Town + close to the Katy trail! Lawn care included in yearly fee! Full brick front elevation greets you into this open concept floor plan w/lots of natural lighting featuring hardwood flring thruout main level! Cook's delight kitchen w/Espresso cabinetry, granite counter tops, stone tiled back splash & SS smooth top stove, Blt-in micro & DW. Refrig negot! Lg pantry! Upstairs master suite offers full private bath w/adult height vanity, tiled flring & step in shower + spacious walk in closet! 2 additional bedrms + hall bath w/tiled flring complete 2nd level. Finished lower level offers plenty of additional living space for family & friends -fam rm w/egress window + flex rm! Lots of storage! Sliding door off Breakfast rm leads to cozy patio area! Ex wide driveway! Sides to open ground!